Hello, my name is Craig Shaw, the resident Golf Guide for this Web Site. In May 1997, my girlfriend and I came on holiday for the first time to Gran Canaria. We fell in love with the climate and life style of the people living here. While still on holiday we began playing with the thought of packing it all up in the UK and become residents ourselves. Only 5 months later, in October 1997, we did it. We arrived on the island with no job and only enough cash to last us a month. We are still here and loving life on Gran Canaria ever more. 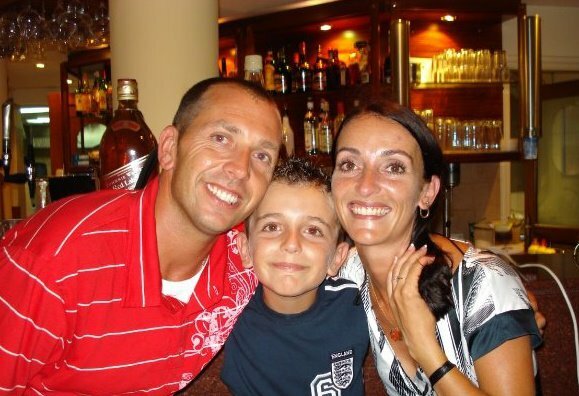 We now have a teenage son, who was born here and goes to Spanish school. He is bilingual and he classes Gran Canaria as his home. What makes life even better, I can practice or play golf any day of the year and not worry about what the weather is gonna be like. At the moment, I am working in an exclusive NIKE Golf Shop in the Meloneras, the posh part of the Maspalomas area in the south of the island. My working hours permit me to work on my golf techinique everyday if I wish to do so. And most of the days I do. Driver: Nike covert set at 8.5degrees neutral. I am a self taught golfer – I have never had a lesson. When I was working in Anfi Tauro Golf for six years I worked really hard on improving my game. For over 10 years now I have been playing golf seriously and have been lucky to get my hcp down to 0. When I was working on the golf course, I had the privilege of free golf on all the courses on the island, so I took advantage of that and practiced every day to get to the level I am now. I am not the greatest iron striker, as I never really worked on my irons. I focused more on my tee shots and my short game. To keep my game sharp, I try to play as many tournaments as I can. Most tournaments in Gran Canaria are in the summer during low season. All the golf courses host tournaments on the island in the summer and anyone is welcome to play if they have aCanarian Federation Card. Some courses may allow you to play in tournaments but you will not be eligible to claim a prize without a federation card if you win. My favorite golfer: The one and only Bubba Watson. This golf player is so cool. He has got a great character, which is great for the tour. The main reason I like Bubba though, is because he is a self taught golfer just like myself and has become eventually very successful. Apart from playing golf and working in a golf shop, I now also write for this website, which gives me a chance to share with you all I know and have learned about golfing on this island, but also about the golf game in general. In my spare time, I normally spend it with my family or sometimes take a fishing and camping trip with some friends to the center of this island to have a great time, enjoy the peacefulness up there and catch some nice carp and bass. I don’t think me and my family will ever leave this Gran Canaria. We simply enjoy the comforts, climate and beauty this island too much in order to leave. 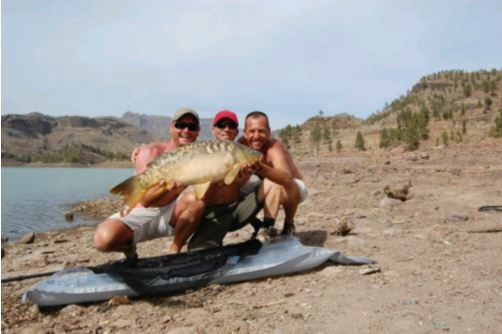 Below you can see me on fishing trip on the lake Presa De Las Niñas, which is about a 30 minutes drive from Mogán Pueblo, the main town of Mogán district on the southwest of Gran Canaria. When you are in Gran Canaria come and see me at the NIKE Shop at the 19th Hole Golf Bar on the Meloneras Boulevard. If you have more questions about golfing, fishing and Gran Canria in general feel free to drop me a line. I will get back to you within a day or two at most if I should be busy playing a tournament. Hello, my name is Craig Shaw, the resident Golf Guide for this Web Site. My family and I love living here as the weather is fantastic all year round. On Gran Canaria it is more of a relaxed way of living.